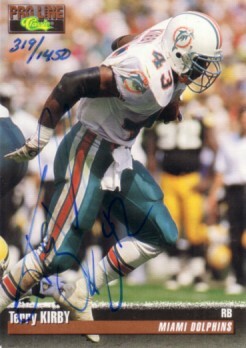 1993 Classic Pro Line certified autograph card of former Miami Dolphins star running back Terry Kirby. Numbered out of 1450 produced, with message confirming authenticity on the back. NrMt-Mt or better. ONLY ONE AVAILABLE FOR SALE.